Scuba Diving the Philippines can be done year round and there are all kinds of scuba diving experiences available to the novice and the experienced diver. You can go muck diving at Negros and Panglao or go on a shark dive at Apo Reef. Do you prefer wreck diving? Go investigate the wrecks of Japanese war boats in the shallow water at Coron. Scuba diving the Philippines is considered as one of the top 10 scuba dive destinations in the world. So what are you waiting for? Many of the (dive) resorts offer day tours or even longer (ten day) tours to the remote atolls and islands of this tropical paradise. 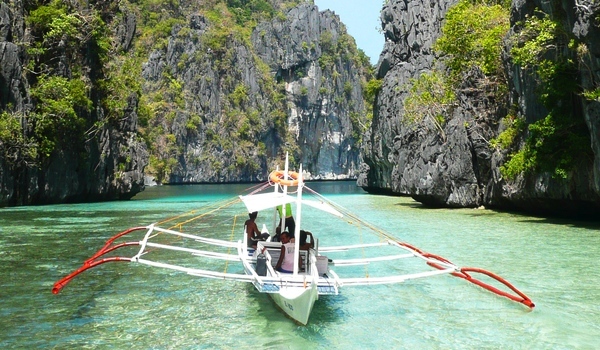 You can also be less formal and hire your own Banca to take you to the spots you would like to dive. The water is a steady 27 degrees and scuba divers do not need to wear wetsuits although it is recommended if you want to protect yourself from stings and coral scrapes. February through to May is the dry season in the country, and this is thought to be the best time to dive. The climate in the Philippines is hot and tropical all year round. Temperatures regularly reach 30oc and the humidity on land is high. Most people who visit the Philippines for a scuba diving holiday do so between November and May however it is not uncommon to see quite a bit of rain during December and January. Sabang Bay – This is a beach near Puerto Galera with shallow waters that are a favourite of photographers. It is charged with microscopic fish including dragonets, leaf fish and black frog fish. Taiei Maru – This is a wreck dive in the Calamian Islands in Coron. The Taiei Maru is a WWII oil tanker sitting upright in 27 meters of water and is almost completely intact. You can take a swim inside the propeller tank where you can see batfish, snappers, scorpionfish and lionfish. Yapek 2 – This is a perfect circular wall of coral off the island of Boracay that boasts sharks, tuna and pygmy coral. Sombero – This site near Anilao, Batangas (near Manila) is full of ribbon eels, scorpion fish, sharks and tuna. The Pier – This underwater pier near Dauin, and Dumaguete has long legs covered with coral as well as cuttlefish, dragonets, seahorses, clown frogs and ghost pipefish. Monad Shoal – This is a reef off Malapascua which is one of the few places in the world where you can watch schools of Thresher Sharks. Crocodile Island – This location near Boracay Island offers a visually stunning look at marine life at just five meters deep. You can see morays, cuttle fish, sea snakes, lionfish and many different varieties of fan corals. Apo Reef – This 324-kilometer reef is part of the marine sanctuary known as the Apo Reef Marine Park that is teeming with turtles, manta rays, sharks. The beach is also heavily populated by seabirds that make it a haven for ornithologists as well. Tubbataha Reefs National Park Because the Tubbataha Reefs National Park is in a Marine Protected Area, you can probably imagine the astonishing beauty and incredibly diverse wildlife that thrive in these waters. Would you like to go scuba diving the Philippines? Check out these scuba dive operators in the Philippines. The Philippines has two international airports: Manila and Cebu. Both accept flights from the Asia region and some have direct flights from Europe. You can reach Manila from Hong Kong, Shanghai, Kuala Lumpur and Bangkok with a two or three-hour flight. A direct flight to Manila from London is about 17 hours long. Once inside the country there are many direct flights to Islands that are "full of" scuba dive resorts. Many of these domestic flights are offered by Cebu airlines. The Philippines offers many amazing places to scuba dive in its calm, warm waters. The Philippines consists of 7,100 Islands, and many of them have reefs just waiting to be explored for the first time. Any holiday here can be as quiet as you want. It will be with just you the sea, sand and palm trees. Or you can join many of the impromptu parties that seem to be always breaking out on the beaches. The resorts in the Philippines also offer many scuba dive excursions as well as scuba lessons from beginner to pro's. Boating, fishing and parasailing are also popular activities and are ideal to plan in between your dives. Want to dive in Philippines?